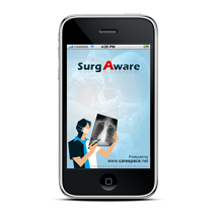 SurgAware is a point of care reference for the general and specific risks of a number of surgeries. This app is aimed at improving the informed consent process before surgery, and was developed by ConsentCare. Improving the informed consent process is an excellent concept, and this app does provide useful information regarding the risks of surgery. This app is far from complete, and lacks a discussion of many important surgical risks such as cardiovascular complications of non-cardiac surgery. Including the frequency of complications might also be useful. SurgAware is likely to become a useful tool for the discussion of surgical risks with patients when the database of risks is more complete and performance issues are addressed. SurgAware costs $2.99 and is available from the iTunes App Store. Great blog and good keep sharing to nice and useful information.